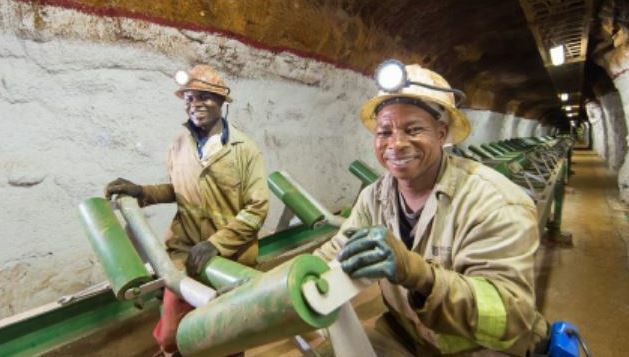 New rollers being installed on a conveyor belt at the Kipushi zinc-copper-lead-germanium mine in the DRC. Source: Ivanhoe Mines Ltd.
Ivanhoe Mines Ltd. [IVN-TSX, IVPAF-OTC] on Monday July 30 announced a new mineral resource estimate for its high-grade Kipushi zinc-copper-silver-germanium mine, which is located in the Democratic Republic of Congo. The new estimate for Kipushi increases zinc-rich measured and indicated resources by 16% and copper-rich measured an indicated resources by 40%. The zinc-rich measured and indicated mineral resource increased to 11.8 million tonnes at 11.8 million tonnes at 35.34% zinc, containing 9.2 million pounds of zinc, 8.7 million ounces of silver and 24.4 million ounces of germanium. The new estimate incorporates Ivanhoe’s second phase of underground drilling at Kipushi that was completed last year, with a total of 9,706 metres drilling in 58 holes. Eight holes were drilled for metallurgy, 31 holes in the Southern Zinc and Big Zinc. The updated mineral resource will be used in preparation of the Kipushi definitive feasibility study, which is expected to be finalized later this year or early in 2019. Ivanhoe shares rallied on the news, rising 1.23% or $0.03 to $2.46. The shares are trading in a 52-week range of $5.05 and $2.41. A prefeasibility study for Kipushi and announced in December, 2017, was forecasting life-of-mine average annual planned zinc concentrate production of 381,000 tonnes per annum, with a concentrate grade of 59% zinc. Total zinc production is expected to be 8.6 million tonnes of ore at 32.14% zinc over a period of 11 years to produce 2.5 million tonnes of zinc metal in concentrate. The Kipushi prefeasibility study anticipated annual production of an average of 381,000 tonnes of zinc in concentrate over an 11-year initial mine life at a total cost of approximately $0.48 per pound of zinc. Under the agreement, Ivanhoe pledged to issue 196.6 million common shares to CITIC Metal through a private placement priced at $2.68 per share, yielding proceeds of $723 million (US$560 million).